1. If you've just happened upon my blog, you're in the middle of a wonderful new release Blog Hop to introduce A Beary Good Year. If you didn't just come here from Katie's blog, you'll want to start at Amy's blog to take in all the beary sweet goodness...then go from here to Ana's blog for your next stop on the beary good hop. 2. I hope ya'll took a moment to add your entry to the "Name That Bear" contest. If you're chompin' at the bit to find out if you won, be sure and check out Alma's blog, Dancing in Pajamas, at 12 EST to see if you've won the prize--every release set for this entire year. Alma's going to make someone's day, no, I take that back--it will make their YEAR!! 3. It's still TCP Tuesday and Amy is our Hostess with the Mostess. The challenge she has issued is to paper piece on your card or project. We'd love for you to play along for your chance at $25 in Cat Cash and to be named Swanky Stamper of the month! She's got all the details on her blog as well, right HERE. SUSIE Q-TIP: This is actually Jen's little trick that she figured out, but I do it all the time now--My acrylic blocks get SO DIRTY, and I'm bad about not cleaning them until they are completely black. She told me to use hand sanitizer to get the ink off and then rinse them in the sink. Comes right off in a flash, better than soap and water. Let's cute to the chase. Your card is just FAB! 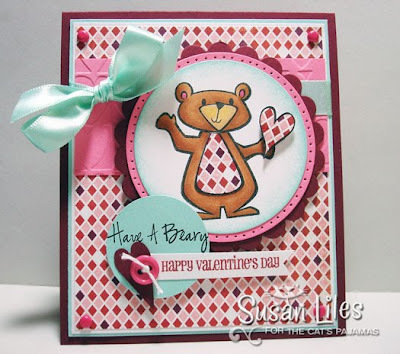 Love the colors and the design just make this little bear pop of the card! What's his name again? Cuteness! I totally love your paper choice here, the card, as always Susan, is just darling! Oooh! I looove the splash of aqua blue on this card, Susan! Beautiful! LOVE this -- the use of the blue color really makes this one stand up and get noticed --- FAB card! I love this one! The color combo and mix of patterns is perfect! Great card! Awesome! I love how his belly matches the bg paper super cute!